Planning a one day Mangalore trip? Check out the 8 offbeat activities you can do in the city. Known as Karnataka’s chief port city, Mangalore balances the hustle and bustle of city life with a relaxed beach vibe. The city offers tourists a chance to soak in the beauty of lush green hills and white sandy beaches. It is also home to a number of monuments and places of religious significance. Even if you have just a day in Mangalore, there is a lot you can see and do. Here a few things to do when you are on a one day trip ro Mangalore. Start your one day Mangalore trip with a visit to a local cashew nut factory. Mangalore is the largest producer and exporter of cashew in India. Raw cashew is harvested and sent to these factories for processing. The cashew is roasted, rid of their outer shell and peeled. They are then graded and mixed with spices to create different flavors. Whether you are a domestic traveler or an international traveler, cashew from these factories is an ideal souvenir of Mangalore. The Kadri Manjunath Temple is in the heart of the city. It dates back to the 11th century and is one of the oldest temples in India. The structure is an example of the Vijayanagara style of structure. This temple is dedicated to Lord Manjunatha, an incarnation of Lord Vishnu who appeared before the sage Parashurama as a result of his penance. One of the main features of interest, a bronze statue of Lord Manjunatha is believed to be the oldest bronze statue of the Lord in south India. Beside the temple are seven sacred ponds and a little ahead are caves of the Pandavas and Sri Yogeshwar Mutt. Less than 4 km from the Kadri Manjunath Temple is another well-known temple in Mangalore, the Sri Gokarnanatheshwara Temple. As the name suggests, this temple is dedicated to Lord Gokarnanatha who is an avatar of Lord Shiva. The temple was originally built in the Kerala style of architecture and was later renovated in the Chola style of architecture. The 60-foot high gopuram is one of the highlights of this temple’s design. During festivals like Dasara, Deeepawali, Navrathri, Maha Shivarathri and Ganesh Chaturthi, tableaux are created at the temple and then taken around the city. Being located along the coast, Mangalore is known for its seafood. If you’re in Mangalore for only a day, try Machali for lunch. The restaurant offers a variety of seafood including pomfret, prawns, kingfish, etc. cooked according to traditional Mangalorean recipes. Prices are reasonable and the portion sizes are generous. Your one day Managlore trip will not be complete without tasting the local cuisine. So enjoy your meal. To know a city, one must not only visit the tourist sights but also experience the local life. The ideal way to do this is by walking through a local market. The Kudla Central Market is the biggest and busiest market in Mangalore. The market is designed as a network of narrow streets with shops on either side. These shops offer perishables like fresh vegetables, fruits, poultry and meat as well as spices, cashew nuts and Ayurvedic medicines. Mangalorean spice mixes like baffat powder, goda masala and other Malwani spice mixes are also available at this market. These spices are ideal souvenirs to take home from Mangalore. 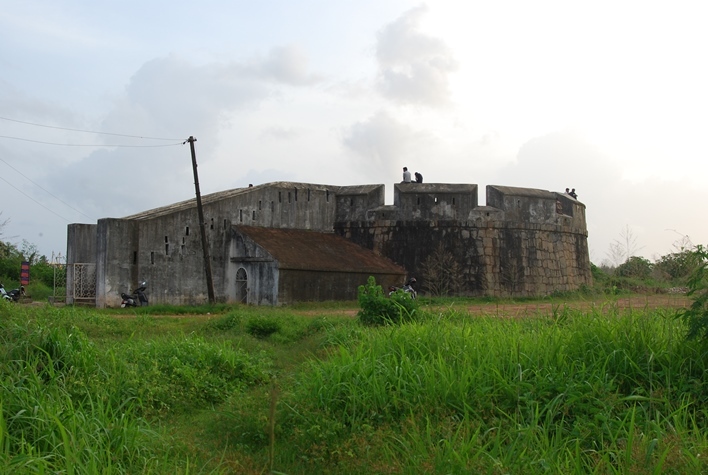 The Sultan Battery was built by Tipu Sultan in 1784 as a watchtower. Cannons were placed on this battery and the powder for these cannons was kept in the basement underground. When these cannons were fired, the watchtower appeared as a fort. In this way, the Sultan Battery played an important role in keeping the British from growing in south India. A visit to the Sultan Battery is not only for history buffs but also offers picturesque views of the Arabian Sea. A number of water sports activities are also organised at the Sultan Battery. The St. Aloysius Chapel on Lighthouse Hill was built in 1880. The church is known for its beautiful interiors painted by Antonio Moscheni, an Italian Jesuit in 1899. His paintings cover almost all the walls of the church and can be categorized as fresco paintings and canvas paintings. Fresco paintings cover almost 600 square meters of wall space in the Church. The paintings on the Church’s ceilings are all painted with oils on canvas. The subject of these paintings ranges from the life of Saint Aloysius Gonzaga, the apostles and scenes from the life of Jesus. A tour of Mangalore would be incomplete without a visit to the beach. This is one of the most popular beaches of Mangalore. The beach offers white sands and a gradual slope that makes it the ideal place for a dip in the sea. As compared to some of the other beaches in Mangalore, this is a little less crowded. Facilities at the beach include water sports such as surfing and jet skiing and boating. A couple of small beachside restaurants offers guests fresh seafood and snacks. The beach is also the ideal place to watch the sunset on a day well spent. Mangalore is known for beaches so end your one day Mangalore trip by taking a stroll through a beach.